In the 1950s, it was swimming pools. In the 2000s, it was elaborate outdoor kitchens. These days, the way you show up the Joneses is with an over-the-top home theater. Americans spent $14 billion on home theaters this year, up about 10% from last year, according to the Custom Electronic Design & Installation Association (CEDIA). And while the average home theater cost roughly $26,000 to get up and running, it's the ultra-luxe category -- ones that cost a half-million dollars or more -- that's seeing the biggest growth. "Our guys do $2 million-plus installations all the time," said Ron Fleming, a sales director at the Custom Electronic Design & Installation Association (CEDIA). The most expensive theater Jeremy Kipnis, of Connecticut-based Kipnis studios, has built so far was for an Argentine tycoon and cost $6 million. Just building the room to house the 30-seat theater alone cost $2 million or so. The projector system, screen and content delivery technology cost almost $2 million, and the sound system was another $2 million. Helping to fuel this high-end trend are online services that deliver access to movies as soon as they are released in public theaters. "The rich and famous don't want to fight in line to see a movie," said Kipnis. Instead these wealthy families can watch new releases in the comfort of their home. Prima Cinema, which sends first-run films over the Internet to its clients, contractually limits a home theater's size to no more than 25 seats due to the licensing agreements attached to many films. The service is pricey: Prima charges about $35,000 for the hardware and $500 for a 24-hour rental. "I was a little taken aback by the cost," said Karen Freedman, who uses the Prima system in her Los Angeles home. But the $500 rental fee pales in comparison with the half million or so she paid to VIA International to build her 16-seat home theater. And Freedman, a real estate developer who is married to an entertainment industry exec, said she has turned the screenings into events. She invites friends over for viewings, serving up catered meals or snacks. While gaining access to first-run films are of importance to some, others are all about ambiance. Sci-fi themes are common, with theaters designed to look like the bridge of the Starship Enterprise. Others are built to look like Bruce Wayne's Batcave or with a "Pirates of the Caribbean" motif. 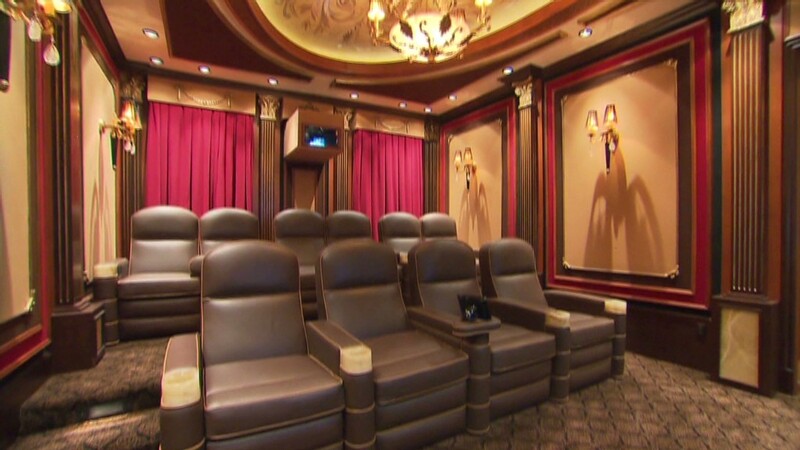 Donny Hackett designs home theaters in and around the Nashville area that range from a half-dozen seats to as many as 15 and are priced from $50,000 to $200,000. His design themes range from Paris cityscapes to Tennessee Titans to 1950's diner. He has had a dozen clients ask him to incorporate his "Titanic" motif into their installations. It features a tracery domed ceiling, like from the movie set, with 1,000 fiber optic stars. Others give him carte blanche on the design. "I've been lucky,"he said. "They give me a blank slate and I provide the accents that surround the technology."